The US knee implants market is expected to be highly consolidated owing to the growth in knee implant industry in the entire healthcare sector. Smith & Nephew, Johnson & Johnson, Stryker Corp., and Zimmer Biomet Holdings Inc. are the four topmost firms in the US knee implant market and are foreseen to hold over 85% of the overall share in the global market, collectively in the forthcoming years. Exactech Inc., B. Braun Melsungen AG, DJO Global Inc., OMNIlife science, Inc., Arthrex, ConforMIS, and MicroPort Scientific Corp. are the other important players. The dominance of key players is majorly owing to their increased concentration on various research activities, along with the constant product development in the US market of knee implants market. 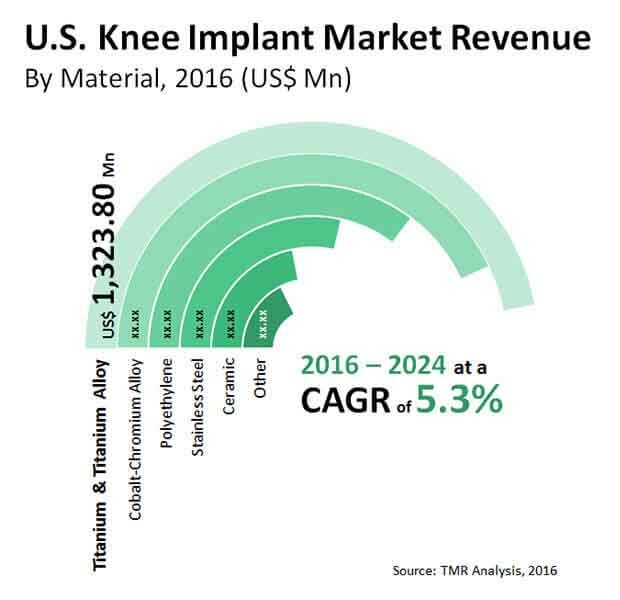 According to Transparency Market Research (TMR), the US knee implants market is anticipated to expand at a robust CAGR of 5.3% within the foreseen period from 2016 to 2024. In 2015, the market was value around worth of US$4.3 bn. This market valuation is likely to grow around worth of US$7 bn by the end of 2024. On the basis of end users the US knee implant market is segmented into ambulatory surgical centers, hospitals, and specific orthopedic clinics. Among these, the segment of hospital accounted for the highest share in the market with 43%, in 2015, of overall end users segment. The segment is foreseen to remain at leading position in upcoming years as well due to rise in number of hospitals in the region. Geographically, the Midwest region is dominating the market, owing to increased ambulatory surgical facilities in the mentioned region. The surge in advancement of technology is contributing in the development of the US knee implants market in Midwest. The major driver for the U.S. knee implants market is the rising of geriatric population in the nation. The betterment in medical facilities and standards in the developed regions has resulted in a consistent improvement in the nation, which has now prompted a circumstance where the geriatric statistic has continued expanding to phenomenal levels. This has profited the healthcare industry to a great extent, as old age people are more inclined to experience the ill effects of a various types of wellbeing concerns, including joint and bone issues that require the utilization of implants. The relentless improvement of the healthcare facilities is hence prone to have a double advantages on the U.S. knee implants market, as quick innovation will prompt the accessibility of advanced knee implant devices, while the change in the entire healthcare norms will prompt development of an indispensable customer statistic. The rise in number of people suffering from obesity in urban areas, because of the rising popularity of undesirable eating methodologies and ways of life, is likewise liable to profit the U.S. knee implants market in the coming years. The urban statistic in the U.S. is in this manner estimated to end up being a key customer for the U.S. knee implants market. The rise in number of people suffering from obesity in urban areas is likewise liable to profit the U.S. knee implants market. The relentless improvement of the healthcare facilities is hence prone to have a double advantages on the U.S. knee implants market.